In this spoken English lesson by Niharika, you will learn 10 English verbs to talk about different ways of eating. These action words would help you to speak English fluently when you are talking about food or eating habits in particular. So let’s get started with this English lesson. To Binge :To indulge in excessive eating. It is also a disorder. Masticate : To chew or bite food with teeth several times before swallowing it. The meat was so tough that it took a lot of chewing. To guzzle : To eat or drink a lot, with greed. You guzzled my dessert! What a pig! To gobble /gulp (down): to swallow something quickly. John gulped/gobbled down his beer quicker than anybody else. To bolt: to eat quickly, because one is in a hurry. He bolted down the burger in just a minute! To nibble: to eat small amounts of food, by taking small bites. You have to nibble sweet corn. To peck: eat sparingly, without enthusiasm, because you are not interested or not hungry. Sally didn’t like the fish. She only pecked at it. To gnaw: to keep biting something hard. I watched my dog gnawing at the large bone. To munch: to chew, eat noisily. We all munched at the cookies as we watched the movie. To quaff: to drink a lot of something quickly, knock back. Guests quaffed champagne while waiting for the bride to arrive. I hope you found this English lesson useful and learned some useful vocabulary that you could use the next time you want to talk about eating or the way someone eats food. 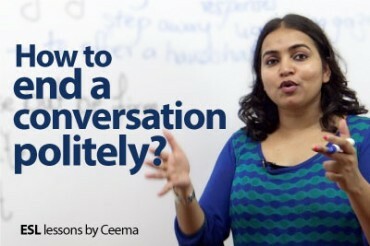 How to politely end a conversation without being rude? 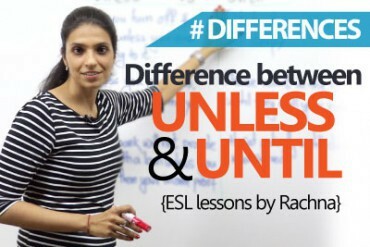 Difference between ‘Unless’ & ‘Until’. 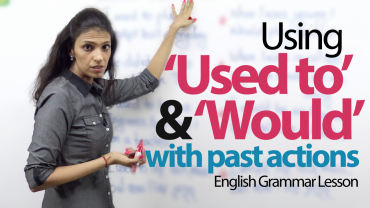 Using ‘Used to’ and ‘would’ with Past actions.